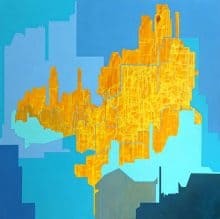 Fox Galleries is proud to present Return to Ruin Nation by Singapore based artist Merryn Trevethan. Collapsing space and intensifying colour, Trevethan’s urban landscapes delineate the impact of technologies on perception. ‘Since moving to Singapore in 2014, Trevethan has become fascinated by the image of the 21st-century global megalopolis. In big Asian cities, the skyline is constantly evolving, a skyscraper forest lit up at night like an amusement park. On the outskirts of town, millions of people cluster in high-rise apartment blocks. Trevethan captures the drama of rapid urbanisation expedited by the digital revolution. Her floating cities are science-fiction dystopias which seem to be born not from simple need but from our growing immersion in virtual reality. Using a mixture of acrylic painting and digital printing, Trevethan’s works suspend clusters of tall buildings against abstract swathes of colour. The effect can be hallucinogenic, especially in a print such as Ruin Nation (56cm x 100cm; edition of five, with one artist’s proof), where cityscapes mirror each other. The mixture of detailed imagery and planes of colour reflects not only the city but the network of circuits and wires that keep it running. It’s a vision of contemporary life as a labyrinth in which we are so embedded that we’ve stopped looking for an exit, and in which a surfeit of information makes it increasingly difficult to be sure of anything’.